Some years ago, I spotted a then-current Jaguar XJR in a car park underneath London’s Four Seasons Hotel, covered in a thick layer of dust. As it turns out, the car was on loan to the hotel from Jaguar themselves, who, once I’d told them about the state of the car, weren’t best pleased with the condition in which it had been kept. Each of the cars on this list were either forgotten (like the XJR), or purposefully ditched by their owners in potentially nefarious circumstances. We’ve excluded barn finds from this list, principally because the ones valuable enough to qualify hadn’t been “abandoned” – rather stored for lengthy periods of time – and deserve a post all to themselves. As usual, let us know if we’ve forgotten any abandoned motors in the comments. 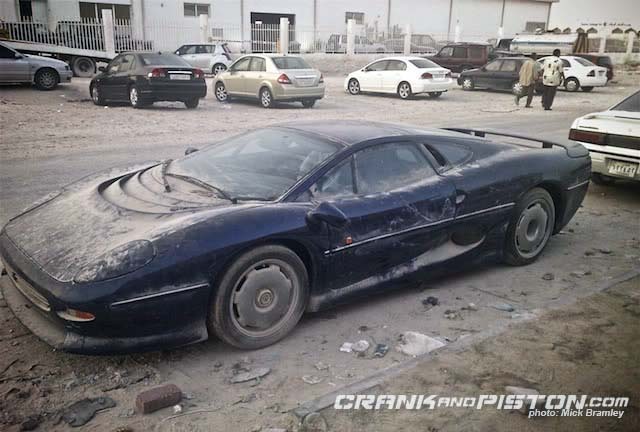 This Le Mans Blue XJ220 only had a paltry 560 miles on its odometer when it was found three years ago, abandoned at the very edge of a Qatari desert. Before it was spotted, the formerly “stunning” Jag’ was last seen in Beirut six years after it was first sold. Nothing is known of its current whereabouts, although we sincerely hope it isn’t still sitting there. One of only 281 produced, XJ220s were £403,000 new. Nowadays, you can pick a good one up for around £150,000. Discarded as if it were one of the used tyres it sits alongside, this one-off Rolls Royce “Centurion” was commissioned and once owned by a Las Vegas-based celebrity, before it was sold and exported to Russia. Tasteful it is not, but no matter how vulgar, no Rolls deserves the indignity of being abandoned – apparently crashed or stuck fast – bumper-less, beside a suburban railway line among used rubber and other such detritus. A new, unmodified Phantom will set you back £276,000. http://www.youtube.com/watch?v=rI7e_2fILJA Found betwixt a duo of Porsches in a Cannes car park, this mysteriously number-plated Maybach had allegedly been in situ for four years before it was spotted in 2012 (anyone know if it’s still there?). Such a motor would’ve set you back upwards of £300,000, before Daimler pulled the plug on the whole brand last December. Given it’s not moved an inch in four years, the big ‘Benz looks to be in remarkably fine fettle, only the Maybach hood ornament is missing. The Air Suspension looks as though it’s lost a little pressure, though. Hellaflush. Uday Hussein was Saddam’s eldest son. Around the time of the first Gulf War he obtained a Ferrari F40, which he kept as part of a massive collection of luxury cars until he was killed by US Special Forces in 2003. 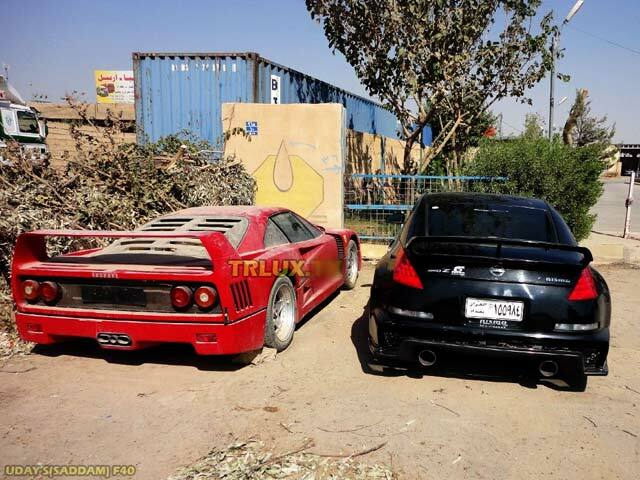 When Iraq was invaded that year, the F40 was reportedly at a garage in northern Iraq having some work done. Abandoned when Uday died, it can still be found beside a dusty track somewhere in rural Iraq. Well looked-after F40s sell for around £350,000. 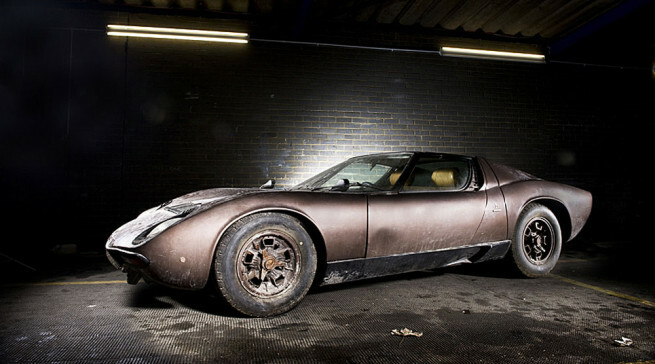 Shipping magnate Aristotle Onassis – famous for marrying JFK’s widow Jacqueline, and for having more money than his native Greece does today – bought this brown Miura S for “Greek Elvis” Stamatis Kokotas in 1969. Kokotas was also an accomplished rally driver – he put 52,000 hard miles on the Miura before its V12 let go in 1972. The engine was sent back to Lambo’, and the Miura parked in the Athens Hilton’s underground car park while it was repaired. Nobody paid Lambo, so they kept the engine. And Kokotas soon lost interest in the once-Raging Bull. So, 30 years later, it was still sitting there. When the Lambo was put up for auction in 2012, having been reunited with its engine, bidding stalled at $483,210 (£317k) – less than its reserve price. In Dubai, it’s actually illegal to be in debt. Bouncing a cheque is a jailable offence. So, expats faced with crippling debts have taken to abandoning their cars – usually with the keys in the ignition, and sometimes with maxed-out credit cards in the glovebox – and skipping town for good. 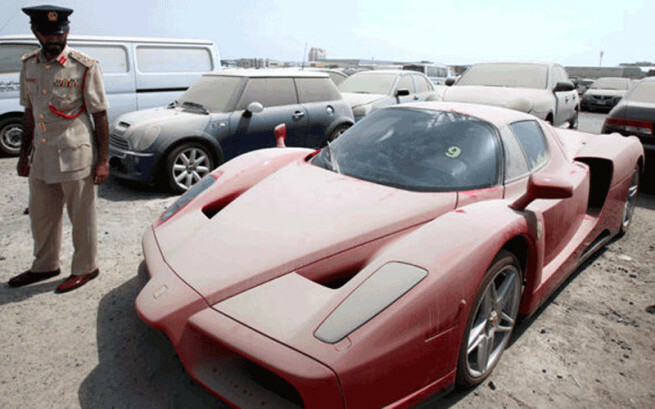 This dusty Enzo is the ultimate expression of this worrying trend. Its British owner allegedly fled, abandoning the £900,000 car after failing to pony up for a series of traffic fines. The car was then seized by the police. After a flood of reports claiming the Enzo was headed to the auction block, the authorities revealed that along with nine other cars (including a Ferrari 599 and 430 Spider), it is the subject of an Interpol investigation concerning its theft. The plot thickens.